She said this would be tough, and she was right. Week 12 of the Gallery and the theme is 'self-portrait'. I have little to add except that the chosen photo was Other Half's suggestion. And no, I am not the gorgeous child on the left - that is a ten-month-old Mr Man. Other Half's words were something to the effect of it being a good resemblance. I hate to think what he says about me behind my back. p.s. 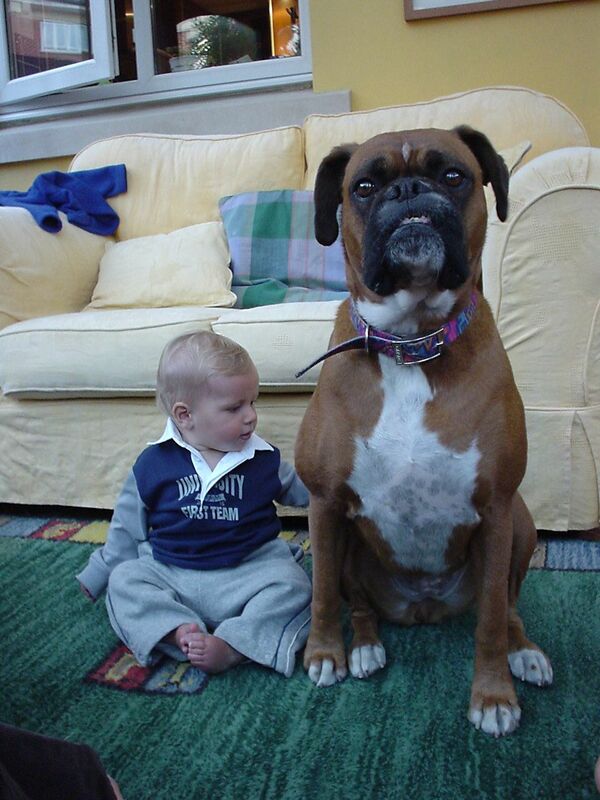 late addendum: the gorgeous boxer - who looks decidedly fierce in the photo and was anything but - was called Honey and she very sadly died suddenly four years ago this week, aged only eight. Missed but never forgotten, like the best things in our lives! Smacked legs on their way to your house! Cheek of the man! good fun though! Thanks for sharing. Maybe you could one up for him next time! Muummmmeeeee.... - Yes, necklace a tad chunky, have traded it in for a bling version now. Rosiescribble - OH is v naughty. He is now on rations. And in the dog house. jfb57 - Am working on a suitably doctored one (and not at all flattering) for next occasion. It's the pout/scowl I like... scary but cute. We'll recognise you at Cybermummy anyway! Nathalie - hmmm, yes, well, he did say other things but I will refrain from repeating them. nomorexcuses - I will be the one on a lead, dribbling over the food and drink. ps - aren't boxers just the greatest dogs! I'm a big fan of the dog, obviously, and I guess if dog's look like their owners... then I'm a fan of you too! :-) OH needs a smacked bum. Porridgebrain - foot extended and waiting for OH, and lovely to meet you too! Do people just laugh when they see that dog? How sweet. I love how he's posed. So serious! Oooh, you cheat, you! LOL You know we're all going to see what you look like at Cybermummy, don't you? Yay.